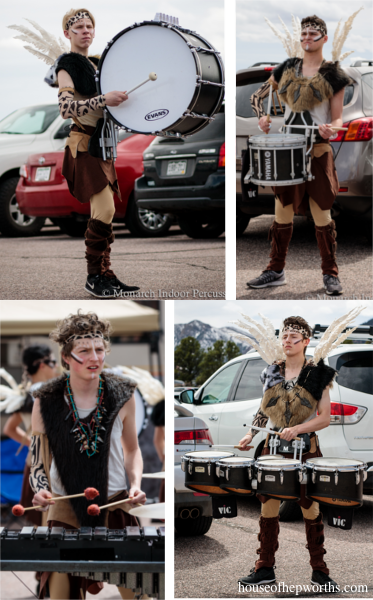 Last week I introduced you to my son’s Indoor Drumline group, where they put on a show this year called Primal. 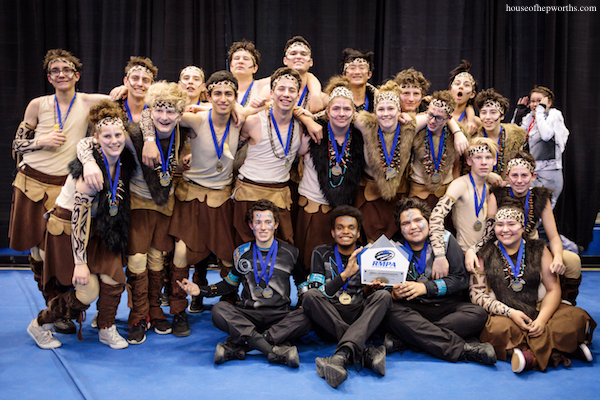 The teens put in countless hours of hard work into pulling off a 1st in State show and we parents coudln’t be any prouder of them. The show would definitely not come together without the help of all the parent volunteers as well. My “job” this season was “Costume Coordinator”. I made sure each entire costume arrived at each show during the season and made sure each kid had what they needed before they preformed. I also was heavily involved in creating the costumes, especially certain pieces of the costume. Because I was so involved in the creation of the costumes, I’m going to break down the costumes and show you the thought process of conception to creation and also what I made. When the theme “Primal” was announced at the beginning of the season, the band directors brainstormed a loose idea of what they wanted. 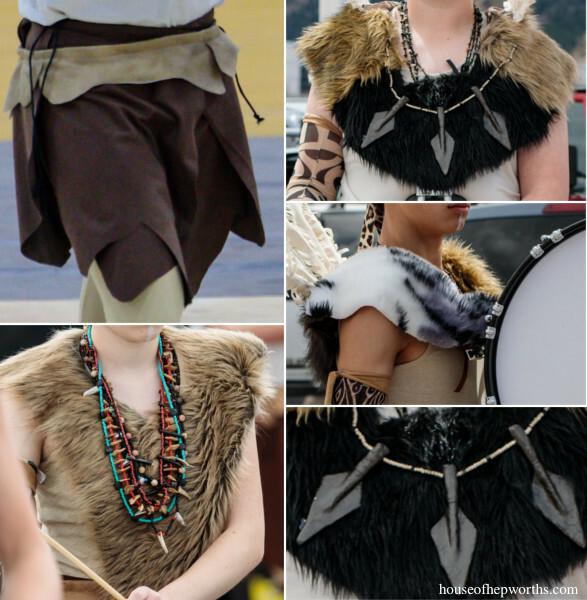 The overall concept for the full costume was Caveman-esque – torn raw leather, loin cloths, fur, spears, feathers, war paint, etc. I did not design the costume; my role was basically to take their ideas and bring parts of the costume to life by creating the final design, pattern, and sewing. Some pieces of the costume I designed and created, other pieces I was not a part of. The main parts of the costume that I was fully in charge of were the skirt (suede loin cloth), belt (leather belt on top of the skirt), and all the furs around everyone’s neck. Here are a few ideas we found during the initial process of trying to design a costume from the ground up. Very primal or tribal. I did have a few limitations that kept me from recreating the skirts as-is. For one, we were dressing high-schoolers, so we had to keep the skirts tasteful and somewhat modest (the initial ideas above showed a little too much skin), we had to make sure each student felt comfortable in their outfit (each student has a different level of modesty and we couldn’t make anyone wear something that went against their personal beliefs), and also, we had a very small budget so real leather was absolutely out of the question. We basically had to create an entire costume for as cheaply as possible. After seeing the initial pictures and ideas, I came up with my first mock pattern. I used some leftover white fabric in my stash and some grosgrain for the tie. To get that “poodle skirt” type ruffle or wave of the fabric, I busted out my Christmas tree skirt (that I made about 17 years ago!). I used the tree skirt to basically get the right curve, and then cut wedge shaped pieces to imitate large scraps of leather. I pinned each piece on a long piece of 7/8″ grosgrain that was leftover from my bow-making days. I don’t own a dress form, so a Christmas Tree box worked quite well! I pinned the skirt to the box so I could trim each piece of fabric to look more like a leather scrap shape. Notice how the white fabric pieces are a lot more “primal” shaped now, to mimic cave-man pieces of fabric. Here is my very first prototype, with me as the model. I needed to send some pictures over to our Parent Rep and Band director to get their opinion and thumb of approval. The fabric for the first prototype was very thin and didn’t hang the same way I knew the fake suade would hang, so I ended up making a second prototype out of burlap and hemp cord to text over to our Parent Rep and Band director. This way they could get a much better idea of the shape of the loin cloth. They loved the prototype and asked me to move forward with the design. From here I set out to create a belt that would wrap around on top of the loin cloth. This would help give the costume even more texture. I made the belt the same way I made the loin cloth but with much smaller pieces of fabric. To try to mimic pleather for the belt I chose a thicker denim I had on hand. My initial belt design was complete with a tooth-type button. It was a fun addition but ended up getting cut during the final phase. Once both prototypes were complete, it was time to put them together. Some fake suede was selected for the loin cloth, and a thick pleather for the belt. We ended up using black cotton cord for the tie. I was given measurements for all 22 kids in Indoor Drumline. 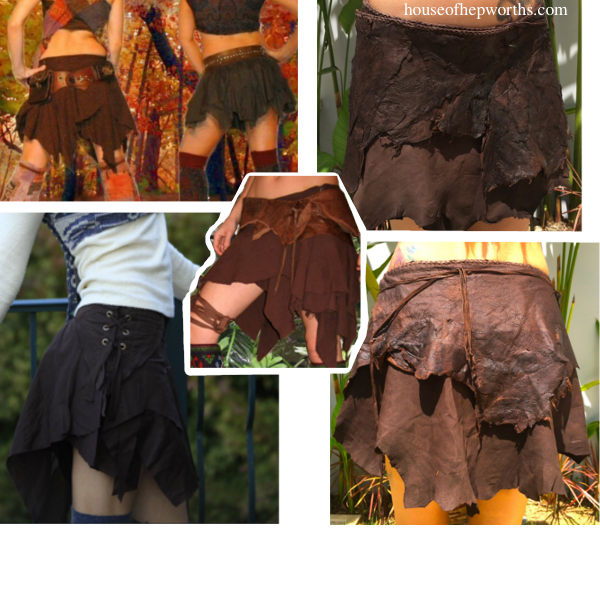 Because the loin cloths were a wrap-style skirt, most ended up being made the same size, but there were a few outlier kids who got a custom pattern. I made the skirt the same way as the prototype. Grosgrain ribbon is the core of the skirt, and each piece of fake suede was sewn onto the grosgrain. The cotton cord ties were attached to either end. Travis wanted to learn to sew, so I taught him on one of the skirts. He was over it in about 5 minutes, but it definitely gave him an appreciation of what I went through to pull the skirts together. I sewed the majority of the skirts but was able to farm out about 7 of them to other sewing moms who helped pull them together before our first show. The belts were made mostly the same way, but each belt is fitted for each kid. I measured each kid and designed it to tie on exactly the right length. This allowed the belts to hang a little loose off their hip. One of my friends who also has a son in the program came over to help cut more than 250 pieces of pleather for the 22 kids’ belts. Here’s the final skirt. It wraps around the body and the longer tie continues around until it meets the shorter tie, at which point they are tied into a bow (with a double knot so it didn’t fall off while marching!). And here’s a group shot of them wearing their costumes (minus all the furs that were attached to the drum harnesses). Next up, the fur! Those were a fun, hot mess to put together, but the final product was off-the-hook.